Motorcycles are a mean machine on wheels that take thrill to another level. However, while enjoying the thrill it is imperative to safeguard oneself from the risks it poses. And for that, you have safety gear which is a must-have for every bike owner. The most important of all the safety gear is a helmet and choosing the right helmet for your head is very crucial. After all, you have only one head! We’ve shortlisted the best 10 helmet brands available in India and their top selling helmets with prices. The list has been compiled taking into account the brand trust factor, safety & pricing. See below. A Japanese company that produces a line of high quality, high-performance motorsport helmets, Shoei has long been synonymous with “premium” in the motorcycle helmet market. With a production process that combines the latest in technology with consumer feedback, modern testing practices, and advanced materials and nearly 60 years of helmet building experience, Shoei helmets are handmade utilizing a sophisticated process that involves over 50 people for each and every helmet. 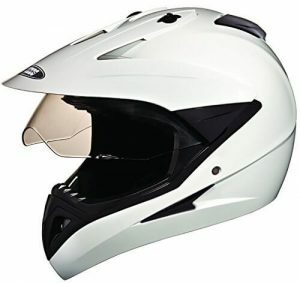 Shoei has a number of firsts to its credit, including being the first to introduce Carbon Fibre/Dyneema and Kevlar into their manufacturing process and being the first to design features like the pod-less and tool-less visor removable system, along with the dual density channeled EPS liner. With an aim to combine top-class comfort, safety, style, and graphics, Shoei helmets are the most sort after amidst racers and speed lovers. 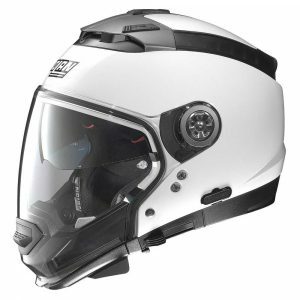 The newest Shoei RF-1200 Helmet is one of the best helmets in the market currently and with its heavy price tag comes a product that is not just one of the most comfortable helmets in the market, but also the safest. Its wind tunnel-tested shell is optimized to provide a compact and aerodynamic shape, reducing wind-noise, buffeting, and weight. Weighing only 3.5 lbps, this is the lightest Shoei helmet and comes with an impact-absorbing dual liner consisting of two layers incorporating different densities, helping to effectively balance the potential impact applied to the more rigid shell. 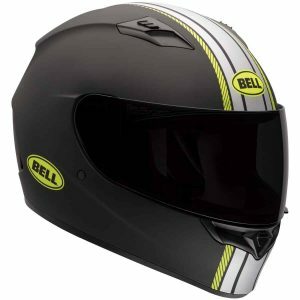 A premium motorcycle and motorsports helmet maker from the USA, Bell Helmets established in 1954 brings with it over 6 decades of experience. A company that prioritizes quality of material over looks, gears equipment for performance and makes sure that it still remains affordable, Bell is the first choice for professionals who believe in speed, comfort and safety all at once. Having earned the admiration, trust, and loyalty of generations of champions in different areas including auto racing, motorcycling and bicycling, Bell is synonymous with instilling confidence and enabling awesomeness for lovers of speed. Its most popular motorcycle helmet is The Bell Qualifier, a full face helmet that comes with their patented ClickReleaseTM feature, an ergonomic chin bar and is crafted for long rides without compromising on comfort. Its polycarbonate shell is not only light but extremely durable to mitigate collisions and save your skull. Price: Rs 35,699 on Amazon India, Rs 105$ on Amazon US. A brand dedicated to motorcycle helmets, HJC has established itself as a leading player in the almost 5 decades of its existence. The combination of its extensive specialized manufacturing experience, innovative ideas, and reasonable pricing makes it one of the most sought-after brands for motorcycle helmets worldwide. They have a wide selection of helmets in the mid to high-end range, and their helmets are constantly tested in both laboratory testing as well as in “real” life for quality assurance. HJC is only one of the very few helmet companies that are equipped with its own state-of-the-art wind tunnel testing laboratory to test for aerodynamics, ventilation, noise, etc. Further, HJC has 3 helmet factories in 3 different countries; Korea, China, and Vietnam. 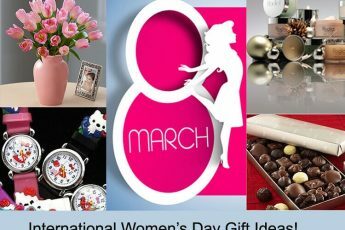 These factories provide strategic venues to produce high end, mid, and entry-level products to satisfy the demands of consumers around the world. 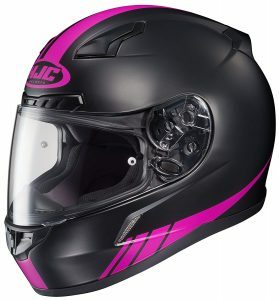 The HJC CL-17 is a popular choice for those looking at a high-quality helmet at a pocket-friendly price. 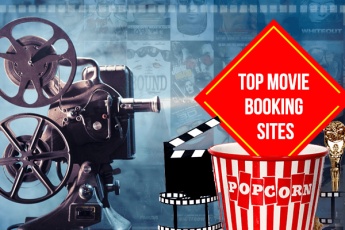 It has similar safety ratings to the high-end models available in the market, making it a complete value for money option. The helmet comes with a Pinlock-ready face shield, advanced ventilation channels, has a moisture wicking interior liner, Pinlock lens for fog-free riding, an advanced polycarbonate composite shell and a super cool interior made from anti-bacterial, moisture wicking fabric. Originated in Italy, Nolan Helmets is one of the most reputed helmet manufacturers in the world since its establishment in 1972. With a focus on quality, safety, durability & endurance, their helmets have been patronized by many famous Motorcycle racers including Marco Melandri & Casey Stoner. Considered to be one of the safest in the world, Nolan helmets meet or exceed DOT helmet standards. They have a premium look and feel and have been designed by professionals who have a keen knowledge about the motorcyclists’ aesthetic. The Nolan N44 Evo Classic N Com is one of its best helmets on the market thanks to its compact volume, double P/J homologation, ultrawide visor, VPS sunscreen (adjustable and fitted with the innovative automatic retraction system), AirBooster Technology upper ventilation system, double lever Microlock2 retention system with micrometric adjustment and set up for the N-Com communication system. 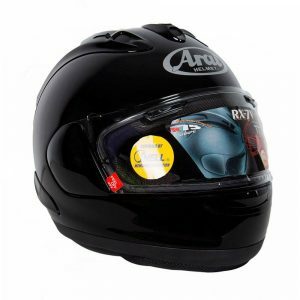 Probably the oldest company, Arai was founded in 1926 by a hat maker and motorcycle enthusiast. Every Arai helmet is hand-built and tested at every stage for high performance and safety. All Arai helmets sold in the USA meet or exceed the Snell Memorial Foundation safety standards and have been ranked first in customer satisfaction in all ten annual J. D. Power and Associates Motorcycle Helmet Satisfaction Studies. The brand has been favored by prominent racers including Nicky Hayden, Maverick Viñales, and Dani Pedrosa. The Arai 7v, one of the most advanced helmets by Arai, is made of a combination of synthetic fibers combined with a lighter new resin that makes for a super strong shell. Its new visor mechanism is derived from their F1 helmets, and while its heavy in weight, its built and fit doesn’t make it feel heavy when worn, which is fantastic. Synonymous with fabulous bikes, Harley Davidson’s helmets are just as popular as their machine on wheels. And just as stylish, strong and high quality. With a large variety of options available ranging from full-face to modular, Harley Davidson helmets satiate every biker need. 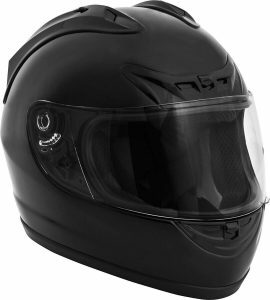 Their FXRG Modular Helmet for Men and Steadfast Modular Helmet with Retractable Sunshield for Women are our favorites for their heavy duty build, and comprehensive features for safety and comfort. 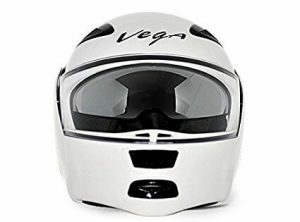 Established in 1994 with the aim of offering a quality product with the most wanted features at a reasonable price, Vega Helmets is a common choice for daily motorcycle travelers in India. They have their own factory in Ningbo China where quality and safety is kept in check. Vega’s Boolean BLN-W-L Flip-up Helmet with Double Visor is a popular full-face helmet that is ISI approved, lightweight and comes with an ABS shell. 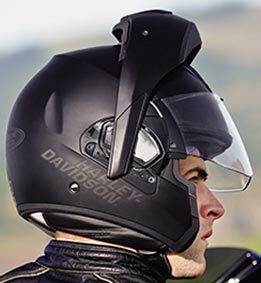 Its superior fit and comfort provided using advanced CAD technology, airflow from the front to the back which flushes heat and humidity out of the helmet, face shield that can be released in two stages and single-button release of the face shield makes it a comprehensive choice for daily motorcycle commuters. 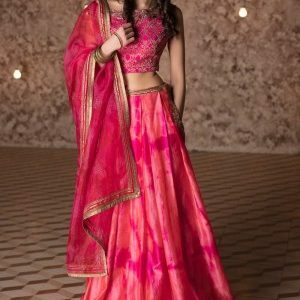 Get coupons and offers from Snapdeal on GreatBuyz for your online shopping. Indian brand Studds Accessories is one of the leading manufacturers and exporters of helmets & two wheeler accessories in the country. With a state-of-the-art manufacturing plant located on main Delhi Agra highway that churns out over 5 million helmets every year, they have their presence with partners in over 35 countries in North and Latin America, Europe, Africa, Middle and the Far East. 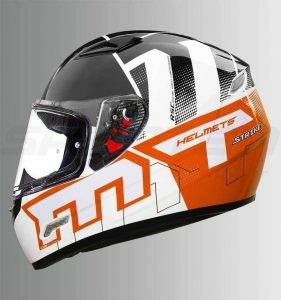 The Studds Motocross Plain SUS_MVPFFH_WHEL Full Face Helmet with Plain Visor is a fabulous choice for daily commuting that’s to its superior qualities that includes a high impact grade outer shell, optically true injected polycarbonate visor (Mirror finish) with a duly silicon hard coat that provides scratch resistance properties and regulated density EPS concussion padding lined with specially treated anti-allergic velveteen. Its ISI approved and is a fabulous combination of comfort and style. Short for Manufacturing Thomas, MT Helmets is an internationally helmet brand in the market since 1968. Operating in more than 95 countries MT Helmets’ main goal is offering quality and great service. They come up with new products annually and their products are approved by the most demanding international homologations to ensure safety. Their helmets are DOT Certified, ECE/ONU 22.05.P (EU) and SNELL USA (USA) certified, and have also been granted with the NTC 4533 (Colombia) and NBR7471 (Brazil) homologations which are only granted when every single component of the helmets has duly passed an established and exhausted security examination. The MT Mugello Strike Helmet is a perfect choice for those looking for a helmet with sharp, aerodynamic looks and superior quality. Its Dual certified (ECE R-22.05 (EU) & DOT (US))in safety and is armed with Max Vision visor for clear viewing. Launched in 1999, Fuel helmets has a simple mission: Design safe, reliable helmets and accessories for price-conscious consumers. In the last 19 years of its existence, the brand has become a force to be reckoned with, offering top-selling helmets and accessories that are affordable and, most importantly, put your safety first. The Fuel SH-FF0014 Helmet features a lightweight thermoplastic shell with UV clear-coated paint, a quick release shield and dual top vents and brow vents for better circulation. Removable cheek pads allow for easy cleaning. This helmet is DOT approved – meeting Federal Motor Vehicle Safety Standard (FMVSS) 218.